The Spear-Bearing Sky-Raiser is the higher one of the Two Sky-Raisers (as-simakan), and for this reason it was sometimes called the Watcher. In ancient Arabic, the term simak indicated something that was used to raise something else high up. When the Two Sky-Raisers reached the midpoint of their travels across the night sky, the uppermost one was almost at the zenith, right over your head, and the lower Sky-Raiser was almost directly below it, about halfway up the sky. The Two Sky-Raisers were the pillars that held up the canopy of the heavens. The Spear-Bearing Sky-Raiser is so named because it has a bright star close to it that is said to be the Spear (ar-rumh) that it has thrown. 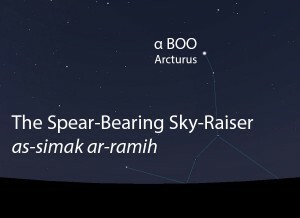 The Spear-Bearing Sky-Raiser (as-simak ar-ramih) as it appears in the west about 45 minutes before sunrise in late April. Sky simulations made with Stellarium. The northern one of a pair of very bright stars that are spaced widely apart. In the calendars of Qushayr and Qays, the morning settings of the Two Sky-Raisers defined the start and end of the short rainy season of summer (as-sayf). In this calendar, the Spear-Bearing Sky-Raiser is referred to as the Watcher (ar-raqib). Because the ecliptic (the path of the Moon against the stellar background) passes through the Unarmed Sky-Raiser, within the context of the lunar stations only it, and not the Spear-Bearing Sky-Raiser, had the honor of being a lunar station. 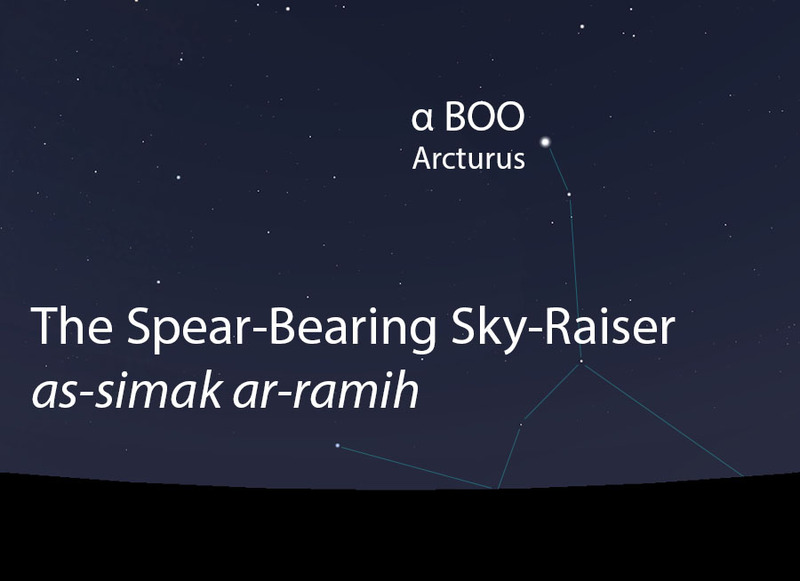 The Spear-Bearing Sky-Raiser is one of the two primary stars of the Sky-Raisers (as-simakan, السماكان) folkloric celestial complex.